There's another issue of Innovation Edge, the Autodesk Labs newsletter, available for your perusal. 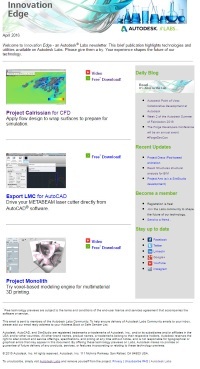 This brief publication highlights technologies and utilities available on Autodesk Labs. Something people don't always know is that technology previews are free. All we ask is that you try them and give us feedback on your experience. This applies to Subscription customers, non-Subscription customers, and students. Trying something, liking it or hating it, but not telling us, is the same as not trying it. Autodesk Labs has its home on the Autodesk Feedback Community site, the same site that hosts Autodesk Beta projects. Technology previews are open to the community at large and may be discussed publicly.